We pick up right where the last issue ended. Superman just redirected what was left of the largest piece of the Justice League Watchtower that plummeted from Earth's orbit. It was set to hit the middle of Metropolis and Superman couldn't stop it, so he pushed it toward the city's industrial area where Brainiac had told Lex Luthor to hide from the blast. Thanks to Brainiac's subterfuge, Luthor believes that this is all Superman's fault. 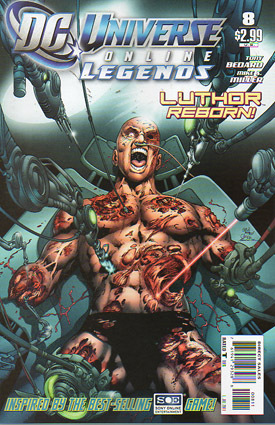 The blast did not kill Lex, but injured him greatly. He has been impaled with sharp metal debris, causing severe spinal damage and internal bleeding, and lost both his arms from approximately the elbow and both his legs. Superman is obviously completely unscathed and tells Luthor to lie still because he's in shock and hurt worse than he realizes, but Lex insists that he will have his revenge. A helicopter arrives above and warns Superman to leave immediately or face prosecution, but Superman has better things to do anyway and takes off to find Brainiac. At S.T.A.R. Labs, Batman tries to pinpoint Brainiac's location, and hopefully the missing Daily Planet building, but also worries about Martian Manhunter's injuries. It seems that J'onn has lost certain abilities to the exobytes, such as shape changing and his Martian Vision, but he still has flight and strength. Superman breezes in and promises that they'll find a way to reverse these effects, but Batman suggests they start by anticipating Brainiac's next target before more people are hurt. FINALLY we return the story to the Daily Planet, which has been bottled up in Brainiac's ship. Lois can't seem to communicate outside and Perry White hopes they'll find some way out. Jimmy finds a pair of binoculars from Steve Lombard's desk, but Lois steals them away quickly and notices the adjacent bottles containing landmarks from other planets. Luthor's body vanishes in a flash of light, causing his bodyguard to further threaten the doctors since no one has any idea where he could have disappeared to. But Luthor is safe on Brainiac's ship, having been beamed there so robots can save his life and even augment his body. Brainiac explains that Luthor is an important part of his plan and that he needs him if Superman is ever going to be defeated. Unfortunately for Lex, the procedure is going to be incredibly painful. Not that it matters to Brainiac. Batman contacts Oracle, who organizes teams of heroes across the globe to find Brainiac's next target. Flash runs through Continental Europe while Green Lantern checks in on Rio de Janeiro in Brazil. Superman flies over London as Firestorm covers Australia. The Great Ten protect China and the Rocket Reds look out for Russia while Martian Manhunter focuses on Northern Africa. But no one can find a trace of Brainiac or his exobytes. On Brainiac's ship on the far side of the Moon, Lex's new enhancements are completed, but much to his chagrin, his body has been essentially mutilated in the process. He now appears to be wearing a permanent prototype of the suit he will have in the future scenes and game videos. Brainiac reminds him that this is all Superman's fault and that now, vengeance is in his grasp. Luthor refuses to believe that Brainiac gave him these gifts without drawbacks like microphones and cameras, but Brainiac insists that all this is necessary to take on someone as powerful as Superman. At the Daily Planet building in the bottle, Lois uses the binoculars to see Lex Luthor approaching. He unhooks the bottle from its pedestal and studies it up close. Despite his scarred face and cybernetic body, he closes in to the glass and shows the inhabitants what he calls "the new face of heroism." Story - 5: This is my favorite part of the story so far. Last issue took place entirely in the future and set up the second in-game video. Although some of the events from the present story are hinted at in the game, most of this is new and it's where the players can learn those parts of the story. The hero plot is essential to the comic, but not the game. It's so much fun to see the heroes gallivanting all over the planet trying to figure out Brainiac's next move, but unbeknownst to them, the plan is taking place out in space right now. Lex Luthor's hatred of Superman in any continuity is no secret and even though there's little if any need to give him more reason to despise the Man of Steel, we get it here anyway. Brainiac is completely in control at this point and we've already seen how Lex will eventually take his revenge. But there's still a lot more that needs to happen in order to get him to that point. Lex and Brainiac have teamed up a lot in the past, especially that Silver and Bronze Ages of the comics (1950's-70's). What always gets in their ways about defeating Superman is each other. Brainiac plays Luthor like a pawn and no matter how smart Lex is, Brainiac is smarter in the present. The offshoot, as we've seen in the future, is that Lex makes it his personal mission to be even smarter. Last time, I said the writers needed to return to the story of the Daily Planet Building. Too much time had past. But we get to see it this issue. Thank goodness. Art - 5: The art is completely improved this time out. All of the problems I've mentioned from previous installments have completely gone away. As always, the art is subjective, but this is what I want to see when I buy a comic. From beginning to end, there's a kind of beauty to this issue that not all artists on the arc have achieved. But again, that's in my humble opinion. Well done Mike S. Miller. I wouldn't buy this just for the art, but it's a pleasant addition nonetheless. Martian Manhunter's sweat and Superman's angry veins really shine through. The effects in the bottled Daily Planet Building work really well to show that there's something keeping them shrunk. The lighting effects from within Brainiac's ship even look the way they do in the game. Even more than past issues, this one stands out showing that the comic and the game are really meant to be one and the same. Cover Art - 5: I won't give a "5" rating unless I would buy an issue based solely on the cover. And I certainly would for this one. Sure, Lex looks like Darth Vader in Episode III before the suit and mask were added, but it works because of his anger. His anger is what kept him alive long enough to get Brainiac's help and that same anger shows through on this cover. I honestly never thought I would give "5's" across the board on almost any comic, but this one managed it. Kudos to the creative team. For the first time, I sincerely hope this will be a very long-running ongoing series. Keep it up!